Duke Johnson: Slasher or sluggish? Comments Off on Duke Johnson: Slasher or sluggish? RB Duke Johnson, Miami 5’ 9” 207 lbs. 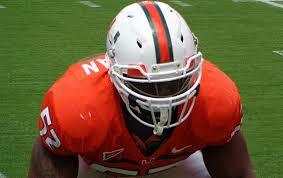 ILB Denzel Perryman, Miami 5′ 10 5/8″ 242 lbs. Clive Walford: Not a Joker, a complete tight end! Comments Off on Clive Walford: Not a Joker, a complete tight end! Although the Senior Bowl was short on overall tight end talent, Miami’s Clive Walford stood shoulders above the rest. In a relatively weak tight end draft class, this tight end might be the most well rounded (receiving and blocking) when compared to Minnesota’s Maxx Williams and Michigan’s Devin Funchess, who might play receiver or tight end depending on the team’s decision. I watched four of his college games against Florida State, Florida Atlantic, Duke and Virginia along with his week of practices in Mobile to get a good understanding of what skills he can bring to the next level. TE Clive Walford, Miami 6’ 4” 263 lbs.